You are driving on a freeway and realise you forgot something at home. You want to go back for it. Can you do a U-turn on this road? You are driving on a freeway and realise you forgot something at home. You want to go back for it. Can you do a U-turn on this road? A. Yes, providing you use the gravel joining roads. B. No, not at any time. Correct. If you need to go back, leave the freeway at the next appropriate exit. The difference between a motorway or freeway versus a dual carriageway or expressway is graded exits and entrances. That is, you don't get traffic lights and side roads on a motorway; vehicles get onto the motorway and off the motorway using a slip road: an on-ramp or off-ramp, and they cross the motorway using either bridges or tunnels/underpasses. This means that the exits often (but not always) have a grade, or slope, because they need to take vehicles either up to a road which then will have a bridge across the motorway to the right, or down to a road that the motorway crosses on an overpass. It's this feature that keeps the motorway running so fast because traffic doesn't have to stop or slow down, and it can get up-to-speed to get onto the motorway. It also means that if you miss your motorway exit then there will be nowhere to stop and turn around. You are not allowed to reverse or do a u-turn. 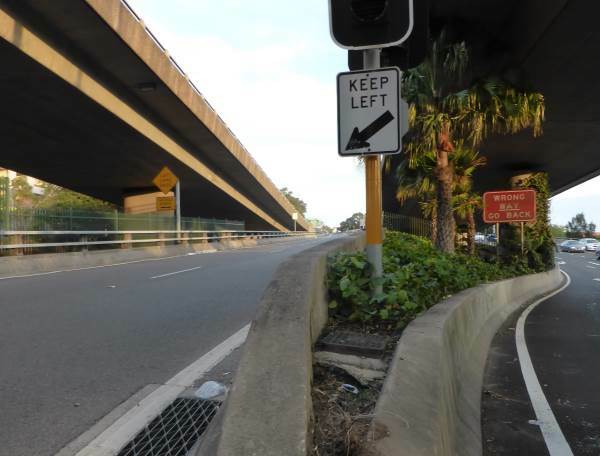 The photo below shows an on-ramp on the left heading up to the motorway and an off-ramp coming down from the motorway. Because there will be a central reservation and traffic is moving fast, you must not do a u-turn on a motorway or freeway. If you are driving on a freeway and realise you forgot something at home drive to the next exit, leave the motorway, then get back on in the other direction and head home. If you miss your exit, simply drive to the next exit and exit there. If you are using a satellite navigation system (or have one on your smartphone) it will recalculate your route, or you can stop and program it with your route if you hadn't activated it and you're not sure of the way. It's very important that you match your speed when merging. The reason for having an on-ramp or slip road is to allow vehicles to do this. Usually the motorway speed limit begins just a few metres onto the on-ramp. Watch for a suitable gap in the traffic and adjust your speed so that you arrive at the correct time. Signal right - this is particularly important for a motorcyclist because the indicator is very visible, whereas motorcyclists are generally less visible than cars and trucks. If traffic is heavy, merge alternately (like a zip). You must never stop at the end of an on-ramp and treat it like an intersection as this is extremely dangerous; traffic already on the motorway will have to brake to a stop to let you on and this increases the risk of nose-to-tail accidents further back on the motorway, and causes traffic congestion.